During 2017, 82 percent of Americans used their mobile phone for online shopping, and 35 percent solely do online shopping on their phones. In 2017, nearly a quarter of all sales conducted online were done on a mobile phone, and it is predicted that by 2021, over half of all sales will be done on smartphones. Considering these shocking statistics, it is important to ask yourself this question: Is my website keeping up with trends? At Delivery Biz Pro, we offer full-service order and delivery management software for local businesses who rely on recurring orders of goods like produce, water, dairy, and propane. We want you to be successful, and we know that one of the ways we can do that is by ensuring your website is mobile-responsive. 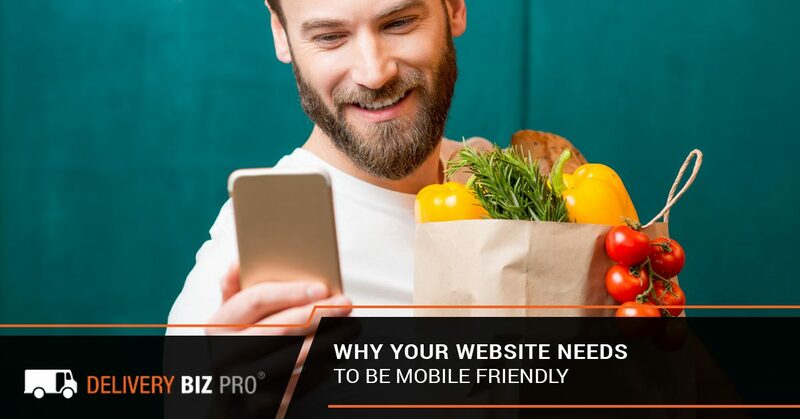 Because so much shopping is done online, you risk losing a big portion of your potential customers by not investing in an updated mobile website. In today’s blog, we are going to discuss a couple important reasons why a mobile-friendly online marketplace is essential for people who run home delivery businesses and offer a few ways we can help! Of course, it is possible that your main competitors already have a beautiful mobile-friendly website, in which case, you need to keep up with them. However, it’s very possible that they do not have websites that work on mobile, meaning their customers who like to do phone shopping will likely get frustrated and find a site that’s easier to use (ideally, yours). Let’s say a customer opens up Google on their phone and types in “milk delivery in Minneapolis.” Two websites come up at the top of the Google search results page: yours and your top competitor’s site. The customer opens up your competitor’s website first and is met with an outdated webpage. They try to zoom in and the text becomes so jumbled they can’t even read it. Images are not loading and they can’t even find the “Contact” button to give the competitor a call to see if their product is worth the mess of a website. Frustrated and annoyed, they go back to their original Google search and click on the link to your business. So, it’s a good thing you knew how important it was to have a mobile-friendly website! Because that customer had such a positive buying experience, they can now confidently recommend you to all of their friends and family in the area. While it is unfortunate to admit, no matter how amazing your product is, if customers cannot easily order it online you will have trouble growing your business. We are an incredibly visual species. We like things that look nice and neat. If your website reflects this both on mobile and on a desktop, you are opening the doors for new customers to walk right in and place orders. 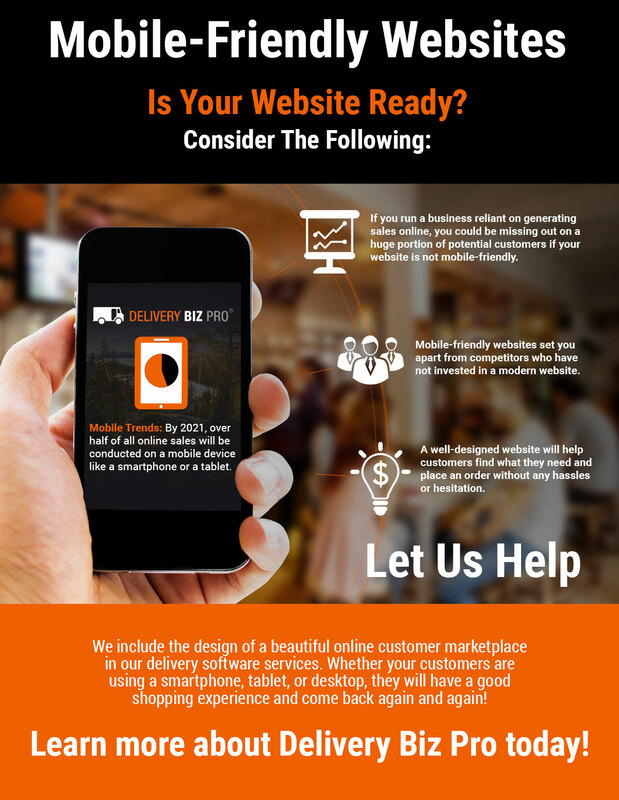 We know you have a great product, now you need to show that to skeptical customers with a beautiful and easy-to-use website. Delivery Biz Pro specializes in helping small businesses that run a home delivery service be successful with the right tools. If you haven’t guessed by now, one such tool is a mobile-friendly website. Included in our delivery software services is the design of a beautiful online marketplace where customers will love to browse and add products to their carts. We include website design in our services because when we handle that side of things, you are able to consolidate the digital side of your service with one company. Rather than having one party design your website, another handle your payments and orders, and a third create delivery routes, we do it all. This means everything works seamlessly from the second someone clicks on your website and places an order to the moment your driver places the order on their front porch. The online marketplaces we create aren’t only for your customers. They are also designed to be easy to use on your end. The online marketplaces are integrated with our delivery management software to automatically add customers to routes based on your specifications, whether it is by neighborhood, day of the week, or some other factor. Best of all, because we handle all of this for you, there is no need to hire an internal IT team. Our experts are consistently monitoring our programs and your software automatically backs up to an Amazon cloud server twice daily, reducing the risk of a calamitous crash where you could lose all of your information. Our goal is to keep everything running smoothly so you never even have to think about your website or how to route your drivers. With a suite of customizable administrative tools at your fingertips, you can generate sales reports, manage inventory, create promotional coupons, send order confirmation emails, and so, so much more. If your business relies on customers placing orders online for recurring home deliveries, then our delivery management software and beautifully designed customer marketplaces might be just the thing your business needs to compete in today’s market. To learn more about how we can serve your business, take a few seconds to apply for our delivery management software. We will find a good time to hop on the phone and chat to learn more about one another’s’ businesses and how Delivery Biz Pro can help your home delivery business remain competitive in a mobile world.